If you’ve been researching the home brewing process, you are sure to have noticed the emphasis placed on ensuring your equipment is clean to avoid infection. But whether you are religious about cleaning and sanitizing your equipment, or are rather lax on that front, there will come a time where you notice something odd about your brew and question if it has become infected. Don’t panic. It is a common concern for new brewers, as the fermentation process can produce some weird looking byproducts. Mead can be a pretty hearty drink, as the honey itself isn’t a super hospitable environment to begin with. And any yeast you pitch should be able to out-compete any other organisms that might try to grab a foothold. But if you’re not familiar with their byproducts you could easily jump to the conclusion that an unwanted microorganism has joined your blooming yeast colony. Before you contemplate deeming your creation a failure and dumping the batch, and burning all your equipment to purge the unclean, let’s try to identify what you are seeing, and whether it is an actual issue. If you are still mid-fermentation, your brew is most likely fine. The real infection threat occurs during the aging process, as that is when oxygen is more prevalent (no CO2 being produced to create a protective layer). The microorganisms most likely to infect your batch tend to prefer oxygenated environments. First up on the false alarm list is a frothy, foaming residue on the surface that appears when the fermentation is going full tilt. This is known as krausen. It is generally a tannish-brown color, and is produced by the CO2 produced during fermentation getting caught in the viscous honey and other debris. During really vigorous fermentations, the krausen can build up enough to push up and out through the airlock. Also a reminder of why to degas your mead during fermentation. When the krausen recedes, it can stick to the sides of the container. Don’t confuse this with some kind of growth, either. It is perfectly normal, and in no way an indication that something is off with your brew. Krausen. 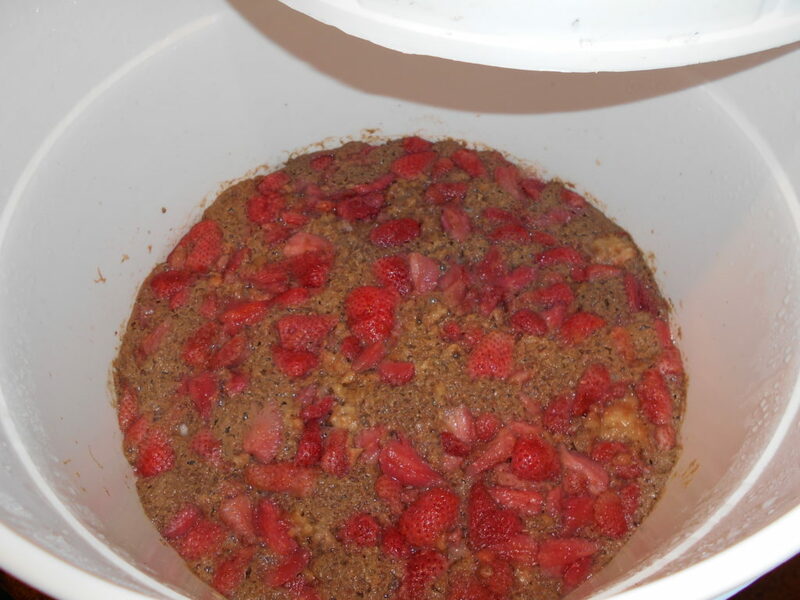 The foam surrounding the strawberries is harmless bubbling caught in the viscous honey mixture, along with some yeast proteins. The second false alarm is a powdery, dusty residue that may appear to settle on the bottom of your brewing vessel. This is the lees. It is usually a whitish-tan color, but depending on what fruits or spices you have added could contain some other colors. The lees, or more commonly referred to as trub in beer, is the dead yeast and other fermentation residue that will fall out of suspension towards the end of the ferment. Mine looks different, is it infected? 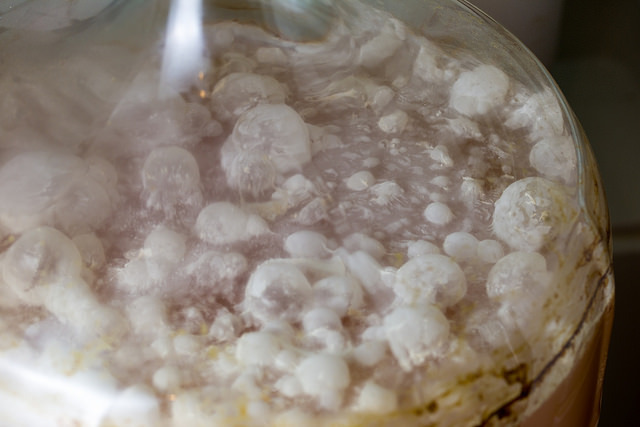 If there’s white colored, bulbous spots covering the surface, or occasionally the bottom of your brewing vessel, then you may have a pellicle growing. These often have a fibrous, webbing appearance that connects multiple large bubble type structures. A pellicle can also appear as a wavy, stringy structure and if left unchecked will cover the full surface of the brew. These are indications that Brettanomyces or Acetobacter has taken hold in your batch. The presence of such a structure indicates that there is oxygen in your mead. It does not, however indicate just how far the infection has spread. 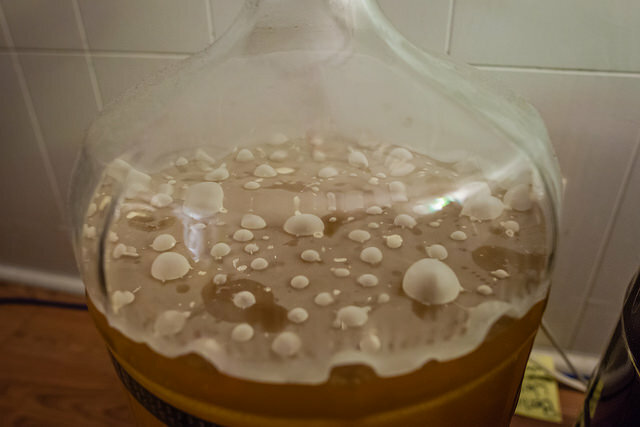 A pellicle has formed on the surface of this mead. An indication of infection. No. All is not lost, yet. There is a chance that your brew is still drinkable. If you’ve ever seen a sour beer, before, this is how they are made. These microorganisms are actually pitched into batches on purpose to create that sour flavor. Instead of dumping it, you should taste it first. Nothing in your brew is going to hurt you or make you sick. If it tastes fine, maybe let it continue. This is how many sour beer makers get their start. They’ll generally get an infection by accident and then designate that equipment to brewing more sours. If you are tasting off flavors, and it is a vile experience, then it is not likely to get any better, and dumping it may be your only option. It should be noted that not all infections will have a visible component. These hidden infections can be difficult to discover, as they may only be detectable as an off flavor that continues to show up between multiple batches. Another clue may be the attenuation of your yeast. Essentially if regardless of what alcohol percentage your yeasts are rated for, and even changing them up your batches end at the same percentage (assuming same sugar content), then you may have something else in your equipment that is pushing past your pitched yeasts’ limit. 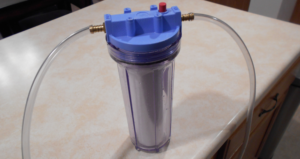 This is only useful if your brews aren’t fermenting dry, however. So how do I prevent future infections? The most surefire way to do so is to identify all the equipment that may have come in contact with the infected brew and replace it. It can be difficult to ensure that your cleaning and sanitizing is hitting everywhere that the infection could be lurking. If you are unwilling to replace these items, be extra thorough in your cleansing routine. And note that if you have multiple brewing vessels, it is possible that the other one could become, or may already be infected as well. The best way to prevent an infection in the first place to to keep any equipment that contacts the brew sanitized. This means waiting for the small amount of time for the sanitizers to take effect after they contact the tool. It is not an instantaneous process. Keep plenty of Star-San or PBW on hand. For more on how to properly clean your equipment, look here.